Yep, you read that right. Converting '58 Plymouth taillights to '57 Plymouth taillights. That is what I would like to do with my car. Having '57 taillights when all the rest of the car is still '58 since I started out with a '58. The 1st reason is I have grown to like the '57 taillights more with how they are inside the whole fin and light up the whole fin, compared to the '58 taillights with how they are a round circle at the bottom of the fin. This is the main and biggest reason why. The 2nd reason is that for family reasons, and to get my dad to like my car more than he does right now. So I don't think my dad knew about the '57s until recently and discovered how they are different from the '58s. So my dad only knew about the '58s until then. So my dad and me saw this movie (not Christine) called the 4D Man recently, old movie, old cars. So a '57 Plymouth Belvy convertible appears, I knew right off what kind of car it is. My dad sort of knows as he thinks it is a '58 Plymouth after seeing mine many times as he sees the dashboard mirror, etc. So then there's a shot showing the rear of the car with the fins and the taillights. So now my dad is real confused seeing what a '57 looks like and not knowing about '57s until then. So now I have to finally explain in a long discussion the differences/similarities of '57s to '58s to my dad. So now my dad knows about '57s- and guess what? He actually likes '57s more than '58s now! Well at least I have finally got him to at least like one finned Mopar... So my dad says if I put '57 taillights on my '58 he will actually like the car more. And I'm not complaining- I have actually grown to like the '57 taillights more anyhow. 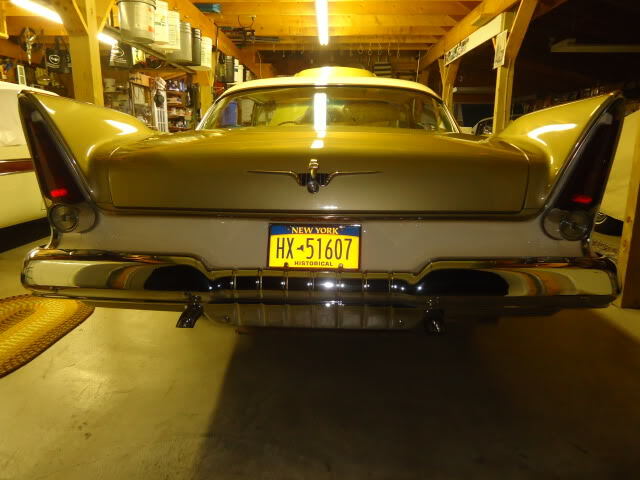 So now I do need to know- is it possible to modify/convert a '58 to accept '57 taillights? If I have to do major converting, that's ok too. After I convert the '58 to accept '57 taillights it is final- there is no going back to all '58. 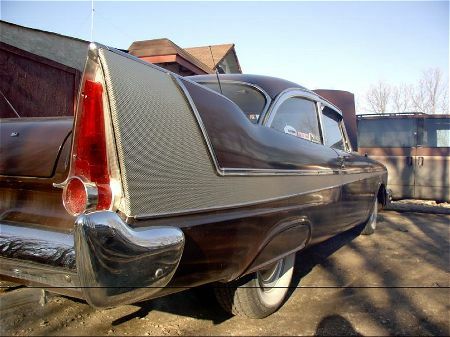 And I actually think that the car will look real cool being all '58 all except for the '57 taillights. Just look at it this way- it will be a car that is unlike all the rest. 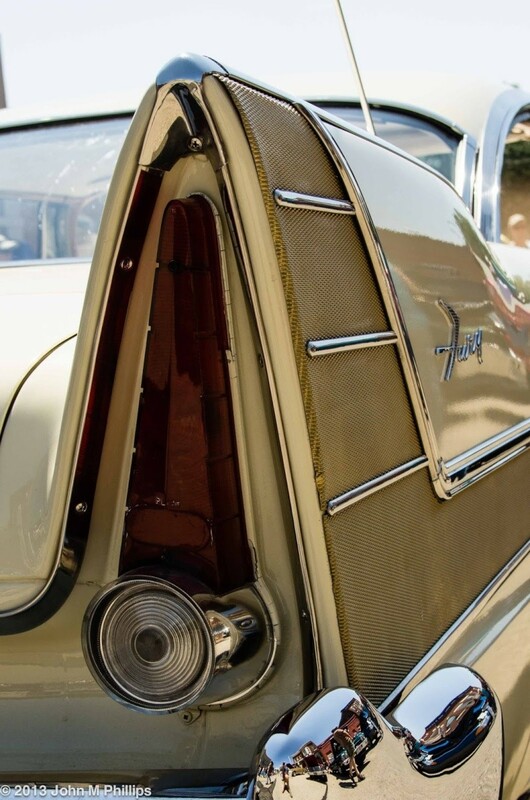 And by the way- I was planning on doing this to my '58 4 door. Even though she's a 4 door, I want her to look real cool, with how I want her to be and look. Jackie, Im sure this is something that can be done. There are many people out there that do like the looks of the 57 tail lights over the 58s. And I cant imagine it would require a lot of work either. Just finding a complete set of 57 tail lights and go from there. Of course my first thing I would do is get the car! It sounds like your dad is finally warming up to these cars. Yeah, I'm sure it is something that can be done as well Brian. I believe I have heard of people converting '57s to '58s including the taillights, so I don't see how it would be a problem to do the opposite of converting a '58 to a '57. Only I am just converting the taillights, not the whole car. So I am leaving the car pretty much a '58 except for the taillights; the taillights will be '57s. Yeah, I am one of those people that does like the look of the '57 taillights over the '58s. And I don't think that it would be a lot of work to do either. The '57s and '58s have the same body style, so I would think that the taillight place would be the same too. Yes, I do think my dad is finally warming up to these cars. Which is a very good thing. 1st thing is get my driver's license out of the way. Yep, I said it. I have currently been driving with my learners permit, with my dad so its legal. I plan to get my actual license this spring, as soon as the roads clear up. 3rd thing is the car. In that order I hope. So I am planning on buying the car THIS year. Not next year, or the year after that, but this year. I have some old '57's I will send you. But you must have the car first. marc. 58belvedere wrote: I have some old '57's I will send you. But you must have the car first. marc. What is this picture and what does it mean? I did not post this! wHO THE HECK IS MESSING WITH US? But the rubber gasket is the key for 57 tail lights.Marc. Wow, that sounds great Marc! Thank you very much! And I know that I must have the car first... I wasn't even planning on getting the '57 taillights until after I had bought the car. And it obviously sounds like it is possible to put '57 taillights on a '58 car. So Marc, we can talk more about me buying those '57 taillights from you after I buy the car, ok? And by the way- I will need both the '57 taillight housing and the taillight lens. Is that what is included with the '57 taillights that you have Marc? Are they in good condition too? Is that the photos that you are talking about Marc? No, there is this odd picture under my quote of a square of cardboard and says use this with checks in a plastic bag. The tail lights are usable. I don't need 'em. Just buy a car and pay shippin'. Marc. 58belvedere wrote: No, there is this odd picture under my quote of a square of cardboard and says use this with checks in a plastic bag. The tail lights are usable. I don't need 'em. Just buy a car and pay shippin'. Marc. So the taillights are useable; that's a good thing. So I am sure that when you say "taillights", it means that it is a complete set of 2, correct? Also, it is the taillight housing along with the lens, correct? If it isn't a problem, would you mind posting a photo of the taillights? It would most likely be a whole lot easier than trying to describe them... I can tell a lot by just simply looking at photos of the taillights. And yes, I most definitely plan to buy the car before I buy the taillights from you Marc. It would sound, and be very silly, for me to buy some taillights for a car that I don't even have yet! I would gladly pay for the taillights from you Marc. Just name the price, I will pay it! I feel that I do owe you money for the taillights Marc; having the '57 taillights will mean a lot to me and will be a key part for the car. So please, I would feel much better paying you for the taillights instead of just paying shipping for them. Thanks again Marc. I'd swear I've seen a few cars that had 57 lights incorporated into the 58 housings,where they replaced the spear with a lens. It would take a bit of work but it looked good. 57belv wrote: I'd swear I've seen a few cars that had 57 lights incorporated into the 58 housings,where they replaced the spear with a lens. It would take a bit of work but it looked good. Glad to hear that other people have done this as well. At least I know that it is possible, and it can be done. And yes, I am prepared for the work involved in doing this project. It seems that almost anything you do when working on an old car takes a lot of work! You know Chris that doesn't look to bad! Someone got creative. Thanks for posting that photo Chris. I must say, that looks very interesting... I see the '58 taillight at the bottom with a '57 taillight sitting directly on top of it. It looks like the '58 taillight housing was used as well. But what I was more planning on doing was to take all of the '58 taillight out including the housing and replacing it with all of the '57 taillight and housing. So the final result would be that I would have a '58 car with a 100% '57 taillight. Should be plenty of good 57 tail light assemblies around still. You'll have to cut holes in the panel behind the light to install 57's though. 57belv wrote: Should be plenty of good 57 tail light assemblies around still. You'll have to cut holes in the panel behind the light to install 57's though. 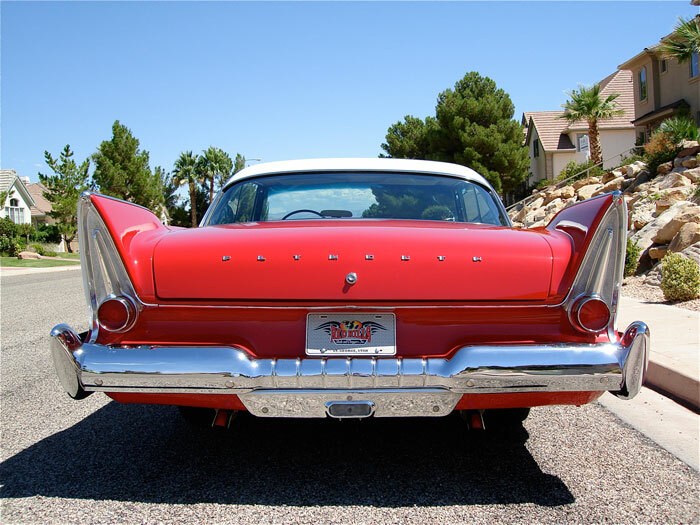 Yeah, Marc offered me some '57 taillights after I get the car, so getting '57s should be no problem at all. Cutting holes in the panel behind the taillight? I don't really like the sound of that. I guess I'll have to do it though if I really want to install the '57s. Which I do. I'll look into it even more after I get the car. Yeah, I'm not a big fan of cutting holes in things either! I will also have to hack up/modify and cut the panel behind the taillights to accept '57 taillights since it's a '58 car. I am not a fan of that either! So the 1st car I experienced these problems 1st hand with hacked up wiring was on the '67 Chevy El Camino. That car had very bad hacked up wiring from what the previous owner had done. It was bad; there was cut wires spliced back together everywhere you looked, wires dangling loosely, wires where they shouldn't be, wires hooked up to what they shouldn't, etc., etc., etc.... I tried, and tried again, to reverse all the damage by tidying up the wiring... But it did no good as I found out. The headlights are duals on this car; the hi-beams refused to work even after I replaced the dimmer switch. The lo-beams worked fine, but you could actually see the hi-beams decided to very dimly come on when the lo-beams are on! It looked quite funny, but not funny for me trying to fix it. Then I had a more serious issue arise to deal with. I would be driving along and all of a sudden all power would cut out; motor stops running, all lights go out, etc. I would have to fiddle around with the main power wire to get the car running again and get back home. It would only do it once in a great while but then it started doing it more continuously until it started every time I took the car out. There was many other issues as well wiring related. I ended up having to replace the whole forward wiring harness to fix the many problems. It seems to have fixed all of those many issues, I hope. Still have the car currently. The problems that have occurred already is the front turn signals only work when they want to. I have checked and cleaned the grounds but it hasn't seemed to help. The taillight issues I am experiencing with the '59 is the brake and turn signals don't work at all. Only light I have coming from the taillights is on the driver's side the brake light is always stuck on. The passenger side comes on only very dimly. I have checked and cleaned the grounds but it didn't help. I have also replaced the brake light switch but that didn't help either. I think I may have to replace the whole wiring harness to fix this issue unfortunately. So anyone here reading this that may have hacked up wiring on their car(s), I do wish you the best of luck in that you will not experience the same issues as I have experienced. It's fine Bob. And Green Christine looks great! 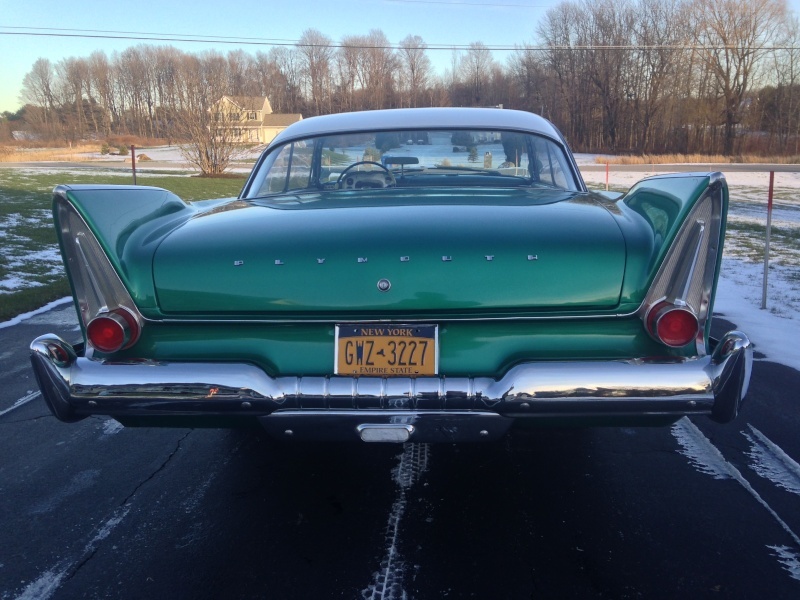 Don't get me wrong, I like the '58 taillights too, but I also like the '57s. I much prefer the overall look of the '58, and what I like about the '57s is their taillights. And I wanted a car with the best of both; but I am finding out that it would be a much smarter idea to just leave the car alone by leaving her all '58. I know what you're thinking Jackie...I was just messin' with you. I had a nice 57....a gold Belvy...in fact, I bet it's still in the member's rides section. I liked the tail lights too...thought it looked better with the whole fin lit up. Thought the best of both worlds would be a 57 tail end and a 58 front end. Bottom line...when you get your car, it will be YOUR car. You can whatever you want with it. Have fun! I decided to go into the member's ride section: Still there! Here's some 57 tail lights...just for you. Yep, I know you were just messing with me Bob. I don't mind seeing pictures of Green Christine either. She is one very pretty car. Wow, you had a '57 too? Very cool! You still have her? I'll go take a look here shortly. 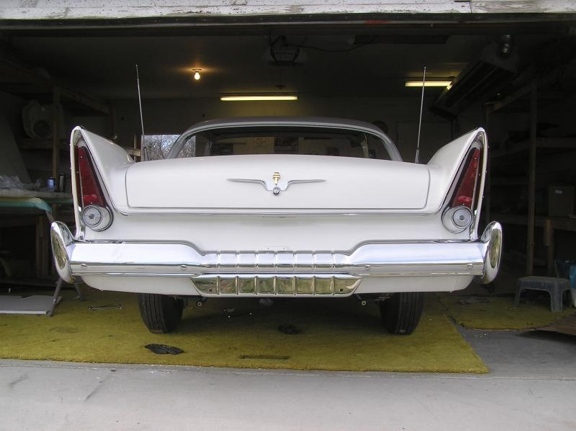 Happy to hear that you agree with me about how the '57 taillights look better with they have the whole fin lit up, and how it would be the best of both worlds with a '58 front and a '57 rear. What I am really concerned about with the converting of the '58 to '57 taillights is 1st the cutting I will have to do on the panel behind the taillights and 2nd is the wiring issue. Trust me, I have had a lot of bad experiences with wiring. I went into further detail of that above (the real long one of mine right above the photo of Green Christine). It's why I am really concerned about this now, remembering all the bad issues I dealt with wiring (it was a nightmare), and how I suspect something bad might arise in the future concerning the wiring after, and if, I do decide to do this. No Bob, no new developments have happened with the '58 I have had my eyes on. All except that she's still sitting there, which is a very good thing. Also, when we got a good amount of snow a couple weeks ago; I found out that she is too long for the shelter she's sitting in. From the rear window back to the rear of the car all got snowed on. It has now since melted off. I wonder if she has one of those famous leaky rear windows? If so, I have a trick up my sleeve with how to cure leakiness. I see you edited your post... So that's your gold '57 Belvy? She is beautiful Bob! I love those '57 taillights too! That was my gold Belvy...sold her in 2013. She looks better now that I haven't seen her in a few years. I wouldn't worry about cutting a few holes. They're just to allow for the bulbs to come through into the trunk...wiring wouldn't be a big deal either. I'm sure your dad could help you do that. With the work I see he's been doing, that would be a snap! Bob, Do you miss your gold Belvy? She is a beauty! I agree with Bob Jackie. If you want 57 taillights you go ahead and do them. Remember a hack job is only done by hackers. I don't think you or your dad are that. Just get the car first and decide from there. Im sure there will be other things you may want to attend to first before the taillights anyways. So it will give you plenty of time to think it over.